If you liked this show, you should follow ARIRA RADIO 2012. 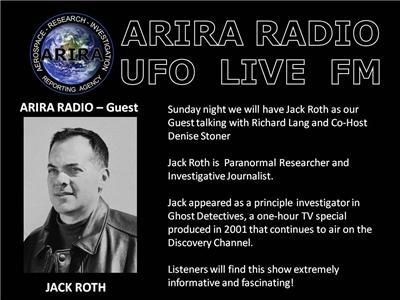 Jack's first investigative forays occurred in New Orleans, La., in 1997, when he wrote and co-produced a TV demo titled Haunting: A Journey Into the Unknown. From 2001 to 2007 — Jack coordinated and led hands-on weekend excursions during which he took guests to various haunted destinations across the United States at some of the most active paranormal locations in the country, including Gettysburg (Pa.), Savannah (Ga.), Charleston (S.C.), San Antonio (Texas), as well as St. Augustine, DeLand and Orlando, Fla.
Jack appeared as a principle investigator in Ghost Detectives, a one-hour TV special produced in 2001 that continues to air on the Discovery Channel. In 2007, he was interviewed for the Gettysburg-based documentary titled The Other Side: Giving Up the Ghost. Jack and noted paranormal investigator Patrick Burke (American Battlefield Ghost Hunters Society) recently completed their first collaborative book effort, Ghost Soldiers™ of Gettysburg. Jack is also developing two other book projects, UFOs and the Sunshine State, an in-depth look at the history of UFO activity in Florida. He is also currently producing a feature-length documentary on the Stan Romanek story, which is considered the world’s most documented alien abduction case. It is set for DVD release in the spring of 2012.